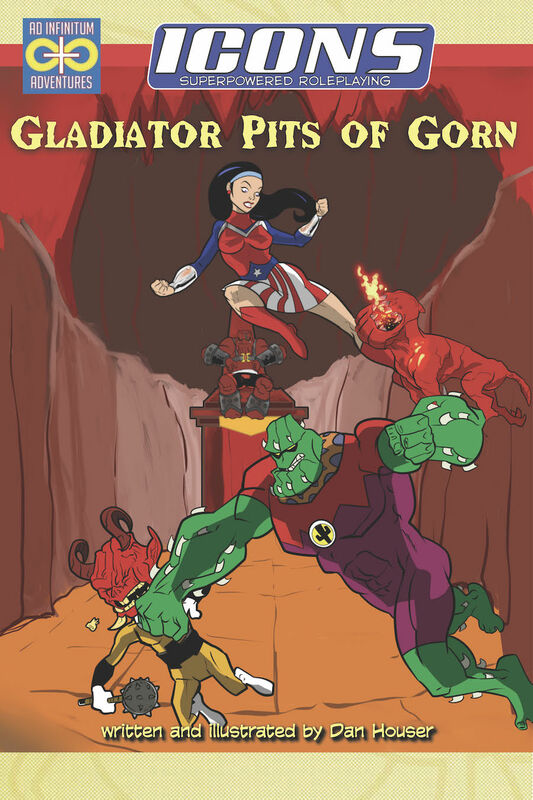 Battle Beneath the Earth … in the Gladiator Pits of Gorn! A one-man earthquake threatens a local dam, but the heroes are in for a far stranger conflict than they can imagine. Tremors lead to their abduction deep beneath the earth into the realm of the Molten Men, where they are case into the Gladiator Pits of Gorm! Can the heroes survive the challenges of Molten Men warriors, magma beasts, and more and overcome the magics of the shaman Emberglass to challenge the cruel General Gorn himself? Their freedom, and the future of the Underworld, stands in the balance. Written and illustrated by Dan Houser, this adventure for Icons Superpowered Roleplaying is suitable for any group of heroes and a great sequel to The Terror of Tiki Pterodactyl adventure. Available now on DriveThruRPG! This entry was posted in Publishing and tagged adventure, houser, icons. Bookmark the permalink. ← The Icons Wiki is Back!